Last December, researchers in Boston College's interdisciplinary environmental studies program undertook to tag and track one of the University's neighbors, the eastern coyote, a species that since the 1970s has made a home in wooded suburban and urban areas of Massachusetts, including Chestnut Hill. After months of patient baiting, the team snared its first subject last summer. The project grew out of the research of Jonathan Way, Ph.D.'05. Since 1998, Way has documented coyotes on Cape Cod and in Revere, a dense suburb north of Boston, working with BC scientists, community volunteers, and teams of undergraduates. 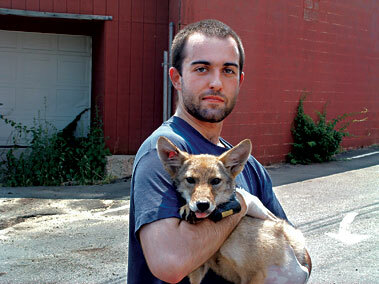 Like Way's previous efforts, the project in Chestnut Hill, organized by Way and Dean-Lorenz Szumylo '02, until this year BC's coordinator of environmental studies, has two goals: Record the habits of the local coyote; and when possible involve the local school system, in order to educate a public still largely spooked by a coyote's midnight keen. WITH ITS THICK fur, the eastern coyote is often mistaken for a wolf, which is larger. But eastern coyotes more aptly resemble medium-sized dogs, with long snouts, triangular ears, and pelts the variegated colors of rust. Males weigh 34 to 47 pounds, and females slightly less. On average, the eastern coyote outweighs the western coyote by 10 pounds; this is because during their migration from the Great Plains, the eastern coyotes "hybridized" with wolves in Canada, a fact only recently confirmed by Canadian geneticists, thanks to tissue samples supplied by Way and other researchers. The larger size of the eastern "coywolves"—as they are sometimes called—may have enabled them to better hunt white-tailed deer and survive harsh winters, such as Massachusetts's last year, when almost 70 inches of snow fell. Will wolves follow coyotes south? It was a brisk but still snow-free December day when Szumylo and undergraduates Maria Aucoin '05 of La Place, Louisiana, and Ravi Kalwani '05 of Warminster, Pennsylvania, placed the team's first two box traps a half-mile west of the main BC campus. Aucoin and Kalwani joined the project as Environmental Scholars; for them, this would be part of a yearlong stint of research and fieldwork for which they would receive credit. The sites chosen for the traps were in the Webster Conservation Area and the Hammond Pond Park Reservation, 114 acres of connected woodlands. The area is perfect for coyotes, inset with roads, small parking lots, and an MBTA line (coyotes often follow man-made paths at night for quicker travel), not far from suburban garbage cans, and flush with small game. The trio bedded down the box traps—bulky metal cages resembling supersized life-safe mousetraps—with dirt and decayed leaves. They raked back the brush surrounding the cage to the footprint-revealing dirt and surrounded the area with butcher's scraps. The box traps would be kept regularly baited but unarmed for several months, in the hope that coyotes would grow accustomed to the "food machines," as Szumylo put it. SPRING SEMESTER was not easy on the coyote study: Heavy snows often buried the still-unarmed traps; an attempt to monitor one station with infrared video fizzled due to faulty wiring; and a family of coyotes that Way had been tracking in Revere for a year was killed with rat poison. What's more, Massachusetts coyotes were drawing bad press. On February 18, a rabid coyote bit a Cape Cod woman, the second recorded coyote attack in state history, and on April 28, in the Jamaica Plain neighborhood of Boston, coyotes killed a small dog left outside unattended. In early July, a Cape Cod security guard was bitten when he disrupted a coyote foraging through bags of illegally dumped trash. Incidents with coyotes tend to grab headlines (by comparison, dog bites send more than 350,000 people to U.S. emergency rooms each year), but, says Marion Larson, a biologist at the Massachusetts Division of Fisheries and Wildlife, the coyote's "simple presence does not present a public health issue." Coyotes become a nuisance, Larson says, when they lose "their natural wariness" of humans, and MassWildlife encourages residents to harass coyotes that appear in their yards with bright lights, loud noises, or water. BY EARLY MAY, nocturnal visitors to the Chestnut Hill traps were eating enough carrion to justify arming. Each evening a researcher set and baited the traps, returning in the early morning to check the night's catch, which included a rogue's gallery of urban-adapted animals: raccoons, foxes, opossums, and even a red-tailed hawk. Finals and Commencement passed, students working on the project graduated, and Way successfully defended his dissertation (on the effects of teaching about coyotes in the public schools)—but still no coyote. Then, on June 27, Szumylo received an early-morning phone call from Ben Linsay, a Newton high school senior assisting the program, saying that a coyote had been caught. As Szumylo half-slid down the steep slope leading to the cage, he thought Linsay was mistaken, and that they had caught a small dog. Closer examination proved him wrong. It was a coyote pup. Way and Szumylo drove the caramel-colored pup, its cage covered with a wool camping blanket, to the office of Bob Binder, a veterinarian in Saugus, Massachusetts, who had volunteered with the Revere project. Before examining the coyote, Binder injected it in the hindquarters with Telazole, an anesthesia. The pup was found to be male, 14 pounds, and approximately three months old (coyotes are full grown at a year). Binder removed the pup's ticks and, since its stomach seemed swollen, gave it medicine for worms. Way then fitted the coyote with a leather-banded radio collar, left from one of the poisoned Revere coyotes. He set the collar at an adult size and lined the inside with high-density foam, which would deteriorate as the coyote grew. Tagging and exam complete, the caged pup dozed in a shaded backyard in Saugus until nightfall. At 10:30 p.m. on a road near the capture site, two volunteers—environmental studies students John Wynne '05 of Gainesville, Florida, and Elise La Douceur '06 of Phoenix, Maryland—and Eric Strauss, director of BC's environmental studies program, met Way and Szumylo to help with the pup's release. A brief discussion ensued on what the coyote should be named, resulting in Chestnut, after one of the study's sponsors, the Chestnut Hill Association. Way lifted the edge of a blanket and gave the others a glimpse of the pup crouched in the far side of the cage in the back of the truck, its small eyes flashing white, and then Way, Szumylo, and Wynne carried the cage down the hill in darkness. The pup darted out of the cage when released, likely to find its family group within a few days (coyotes live in groups dominated by a pair of mated adults, not large packs). And Way, after scattering a bagful of fetid dead rats in the area, planned the project's first night of tracking with Szumylo. BEFORE SUNRISE one morning in mid-August, Szumylo, Wynne, and La Douceur drove the roads ringing the study site in Szumylo's dark purple Chevy Lumina. Wynne sat in the front riding shotgun, and La Douceur sat in the back, behind Szumylo. Both passengers wielded unidirectional antennas attached to a receiver, La Douceur sashaying her antenna through the small rear window. As they swept the antennas, fragile and rhythmic chirps emerged through the receivers' white noise, indicating the direction and, by volume, the distance of the coyote. The results were noted by Szumylo, and the process repeated for the next two hours, allowing a steady triangulation of Chestnut's whereabouts—near a small pond in the woodlands. The coyote's range, they've found, is growing. By the time it is an adult, its range will mirror that of its parents, allowing researchers to determine the family's movements. This fall, Way is teaching biology lab sections in anatomy and physiology, and Maria Aucoin, one of the recent graduates who helped set up the Chestnut Hill study, has taken over Szumylo's role as program coordinator (Szumylo moved to a master's program in environmental management at Duke). In the coming months, Aucoin will host a "Coyote Day," a lecture and Q&A session for BC students and Newton residents. The researchers are planning to distribute classroom materials on coyotes to Newton high schools (pending funding), and will give local students the chance to join them in the field. Several new traps are being added. And Chestnut continues to be monitored as the coyote grows toward spring adulthood.